PolyTurf is a pioneer in the synthetic turf industry and has been an innovative driving force for over twenty years. We have developed long term partnerships with manufacturing facilities in Georgia to design and produce artificial grass using the latest technology to ensure our turf products consistently remain ahead of the curve. Our synthetic turf has been tested by independent labs in order to ensure the highest quality products. We have also engaged in-house and independent technical consulting to review our product specifications and perform inspections to ensure the highest level of quality in our turf. 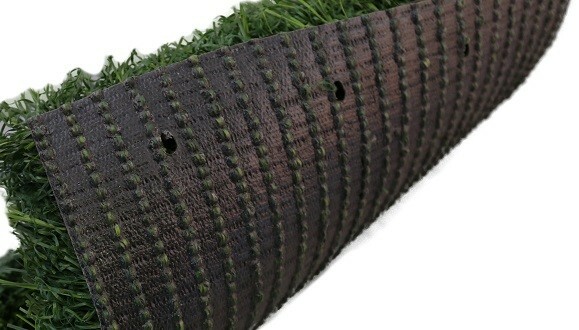 Most of our synthetic turf products are made with a special Cool Reflect yarn fiber that makes our turf up to 20 degrees cooler in the heat compared to standard synthetic turf. Our EnviroFlow rapid draining backing drains at 200 inches per square yard per hour compared to standard synthetic turf backing which drains at 28 inches per square yard per hour. Our EnviroFlow backing also makes the entire turf system 100% recyclable at the end of its life. Additionally, the 3D shape of PolyTurf grass blades makes the turf more durable so that it stands up well to foot traffic and lasts longer without falling flat. We deliver innovation, quality and value by taking a total system approach with investments in ongoing product research, performance testing, environmental testing, manufacturing, and the latest installation and maintenance techniques.